Every week, we make this trip around the fjord to count seabirds. Today we see belugas in front of one glacier and a lot of kittiwakes at the other. At the front of the glacier, the water is coloured red due to the glacier river entering the fjord. The fresh water forms a top layer on the salt fjord water. Underneath the fjord water is clear. 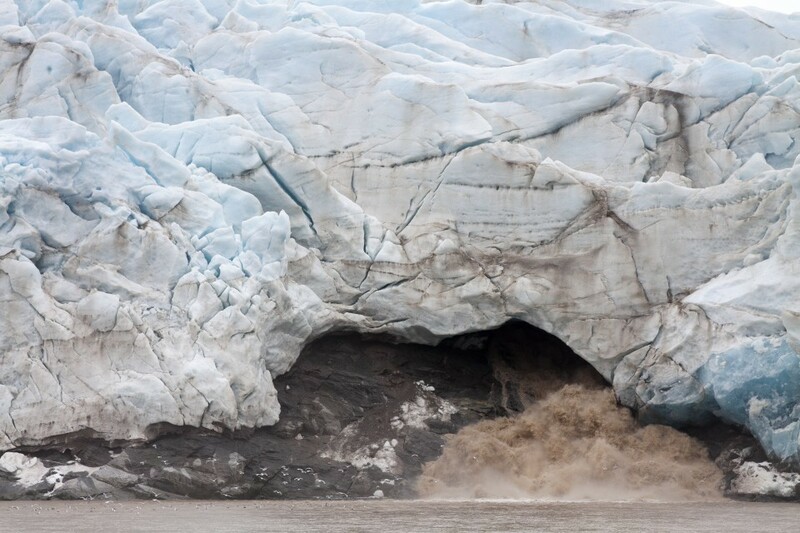 The ice has disappeared close to the glacier front due to the stream generated by the glacier river. In this area belugas are feeding. The fjord is 70 meters deep, but for these animals they dive to he bottom and feed on shrimp and crabs. At another glacier, we can see the glacier river coming over a stone. Here fulmars and kittiwakes gather to feed on krill that is brought to the surface. The birds float away from the richest spot due to the glacier river, but than they fly up and return to the glacier. It looks as a conveyer belt of birds. A little bit further away from the glacier, all ice is gathering and melting. We have to go throught the ice at slow speed. The ice hitting the boat makes lot of noise.